In these modern times, our minds can be overwhelmed and overrun with thoughts, tasks and technology. For those who have had difficulty learning meditation, Zentangle offers a unique opportunity for the mind. It offers a singular focus, relieving the mind of stressful thoughts, a laundry list of things to do, and even distracting the mind from pain. Benefits can include relief from insomnia, memory improvement, and enhanced focus. When we pause daily to practice Zentangle, not only do we feel better, but we have a beautiful piece of art to remind us of this quiet time. 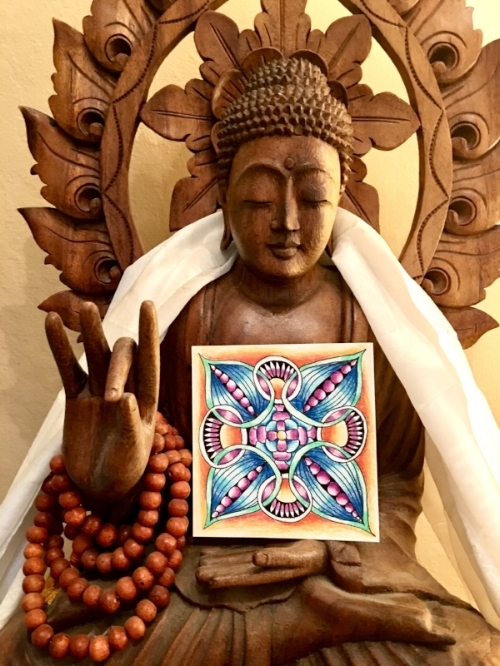 Romi Marks is a certified Zentangle teacher and a certified Kripalu Yoga teacher. She has been teaching since 2001. Her continued training has an emphasis in the therapeutic modalities of yoga. She has completed trainings with noted teachers: Richard Miller-Yoga Nidra 1 Certification, Gary Kraftsow Yoga of the heart, Nischala Joy Devi-Yoga for Cardiac and Cancer Certification, and Judith Laster-Restorative yoga and Doula Certification.